Nestled within private gardens, Traveller Home Angkor features a variety of rooms with city views and free WiFi in Siem Reap. The hotel has its own restaurant. Free WiFi is available throughout the property. 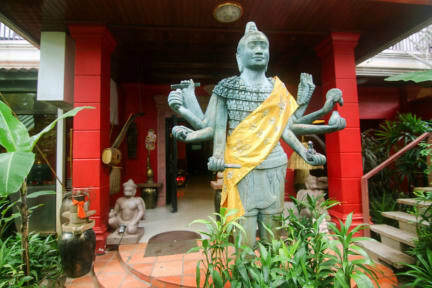 The hotel is 100 m from Artisans D'Angkor and 300 m from Pub Street. Angkor Wat is 6.7 km away while Siem Reap - Angkor International Airport is 8 km from the property. The property offers complimentary airport pick-up services. Each room has a cable TV and minibar. Private bathroom comes with a shower and free toiletries. Slippers and towels are provided.